Mettet as first trial race ? In despite of all our efforts and with 120 interested peole we have not yet enough riders registered to organize a complete ICSB season. The potential is very high because we were fearing to refuse many riders on the starting grid, this championship has received considerable curiosity from journalists and many drivers but much of them are waiting to see before participate, it's the reason why we could not materialize until today. Consequently we will try to organize at least one race this year on the Mettet circuit as a trial run to establish the potential of this championship and begin to make ride legendary motorcycle. We are on negociations with organizers to obtain a round on 25 and 26 of September 2010 on the Mettet circuit. To get more please contact Eric SAUL. Facebook will be the relay to keep you realtime informed about evolution of this championship, creation and following of events, live information, many interested racers could stay informed before participate ! 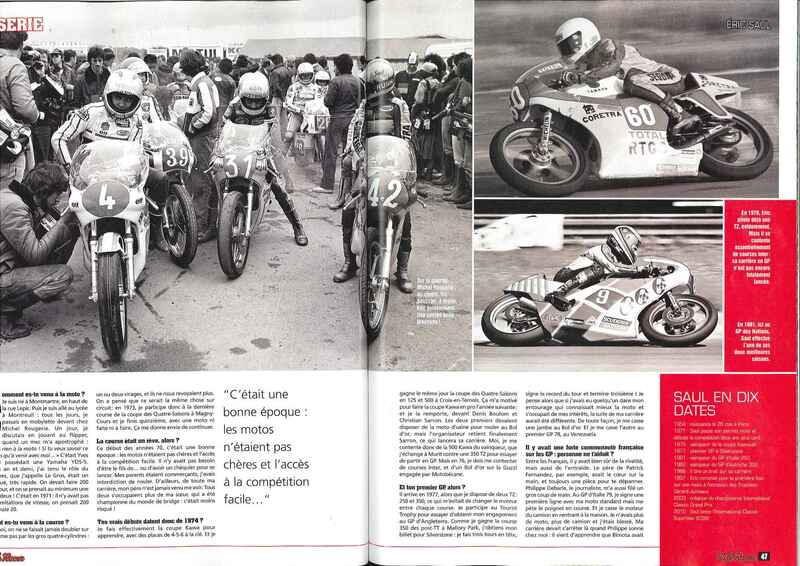 We have interviewed Eric Saul during the Limoges Bike Fair, He has answered frankly to all of our questions like how difficult it is to start the ICSB, why the RC30 team was rejected from the 24 hours of Le Mans and the ICGP success. Hi Eric, let’s start with your carrer. You’ve started racing in 1974 in the Kawa cup, right ? You’re right, I’ve started this cup in 1974 and won it in 1975 ahead of someone called Christian Sarron. Unfortunately I was lacking of sponsors despite a pretty good start in the cup. So you’ve had to work on markets with your father ? Yes I’ve worked on markets, I’ve sold used cars. Even if bikes were not so expensive at these times it was not enough. I’ve kept on racing until 1986 with few money and then I’ve completely stopped. Then you’ve done everything but bikes ? Yes for 10 years I’ve not even open a bike magazine or touched a bike. So in 1999 you’ve created the ICGP ? Right. In 1997 one of my friends brought me to Montlhéry to attend the Gerard Jumeaux Trophy. It put me back into bikes. In 1997 it was the TZ Club and in 1999 it was the ICGP. We have started at the Paul Ricard track during the last Bor D’or taking place at Castellet. Then it was Daytona and a lot of other things to end up to the ICSB. Yes but I have to recognize it’s pretty hard !! We’ve received loads of applications since the beginning. 120 persons were interested and gave us their e-mail address for such a narrow category. But at the end, only 12 have confirmed. I still receive a lot of questions but people are not ready to jump the gap. A lot of people would like to wait until next year but to have a next year, there must be a first year ! 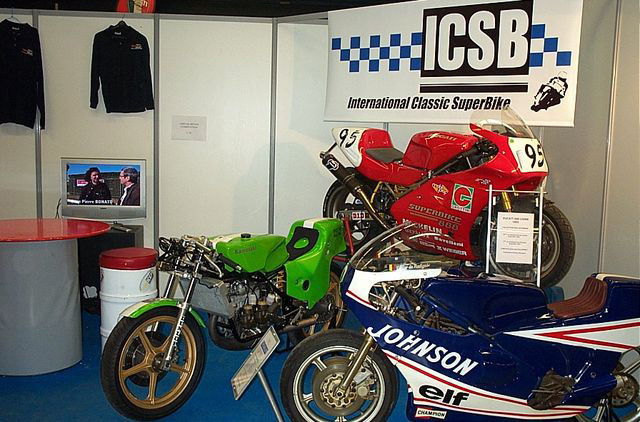 It would be really painful to have to cancel the ICSB as we’re already sure to have ex-works bikes and former GP riders. There is a certain interest for this category and I think this is the future. How many machines are required to ensure this project ? To cover the organization fees we need to have at least 23 machines just to keep the budget balanced. With less machines, we lose money. Until now we’ve already invested a significant amount of money. We had a stand at the Moto Legende Fair, we have made banners, we have an internet website and we have made a lot of travels to meet event organizers and authorities. All these things cost money and now I’m stuck. We have faced the same situation with the ICGP but it was a true crush. This time I work on ICSB for the pleasure and to fulfil a need but it must not cost me money. 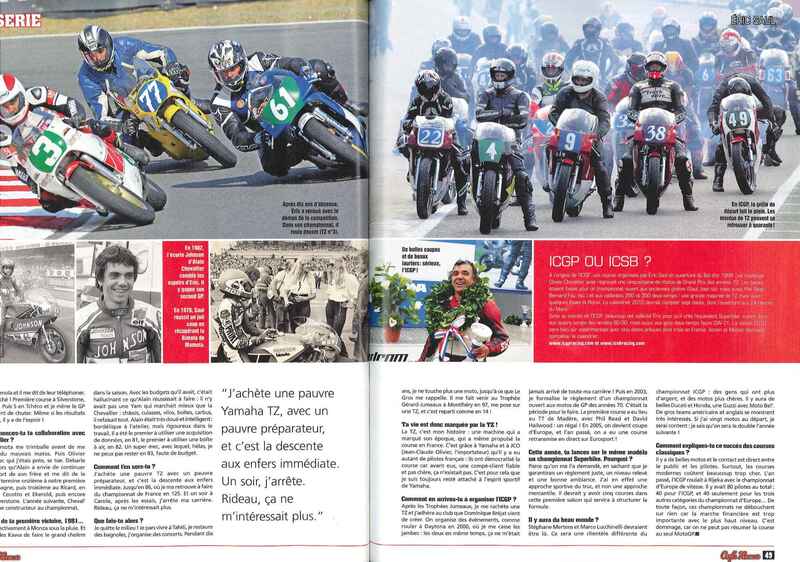 I love racing and I don’t want to disappoint people who have helped me, especially Francis Boutet from Bike 70 website. A lot of people have been involved in this project but now we need the riders to join ! Everyone wants to join but everyone want things to happen first. If everyone continues to wait, nothing will happen. If people want to see this project happening, they have to join now. 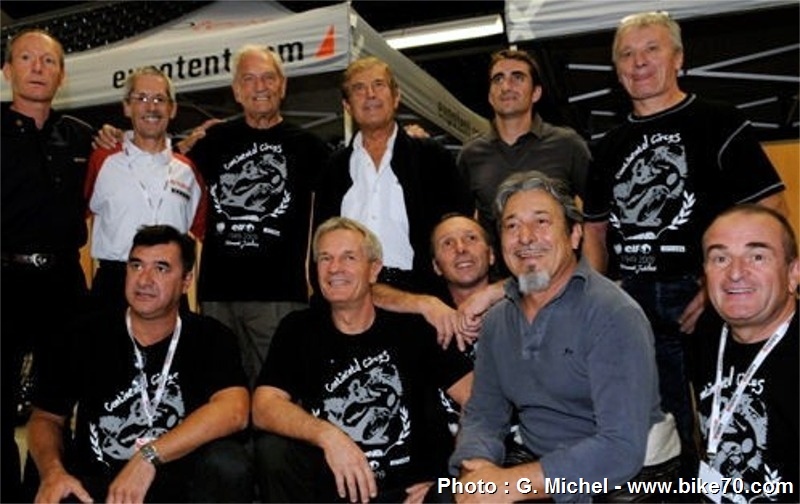 There is already few endurance competitions for classics as Motor Events, the Classic Bol d’Or or the « trophée grand prix d’endurance classic » ? You’re right but for example Motor Events has already a structure which works. Adding an endurance race to an already existing event is far away cheaper and risks are lower. Precisely, as there are already races like the ICSB, it may help riders to think « I like that, I’ll carry on with Eric Saul » isn’t it ? It would be great. But I’m still waiting for them. I would like them to come out. Is it a call ? Of course it is. We are complementary. Endurance requires highly reliable machines to finish the race and it costs a lot when regular superbike races are shorter, then cheaper. Let’s take the example of the RC30 team which has been rejected of the 24 hours for some reason. This is typically the kind of team of enthusiasts who could join the ICSB in order to save it right? Absolutely right. There are some riders including a Spanish one which are ready to join with RC 30. I strongly encourage people like that to join us as RC 30 is the perfect machine for that. Regarding the fact the RC 30 team has been rejected of this year 24 hours of Le Mans, it is logical. Last year the grid was not full and this year there was more than 80 bikes. As world championship organizers they prefer to have the most competitive bikes on the grid. 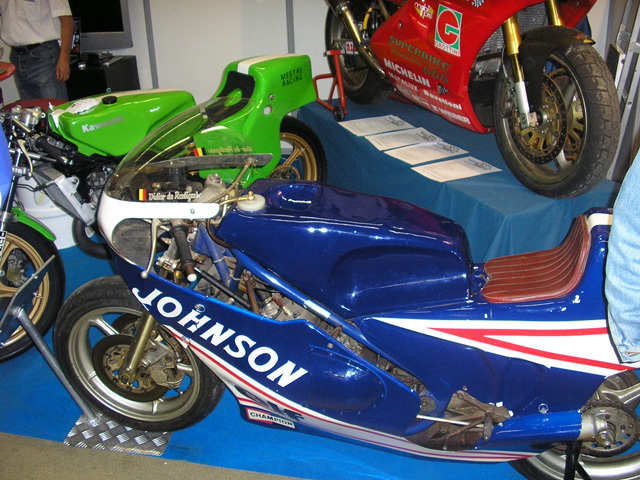 I understand they have refused the RC 30 despite the fact it is a fabulous machine. The ICGP runs very well. We’ll open the 24 hours of Le Mans and there are 13 GP victories and 50 podiums on the grid so it is really a beautiful grid. Moto Journal will publish a paper about us, I hope it will continue like that. I hope to have Carlos Lavado with us the Rijeka race in Coratia. Again I encourage anyone who has a machine suitable for ICSB or ICGP to join us, now or later. Everyone is welcome as the key words are gentleman rider spirit, conviviality and to take pleasure. 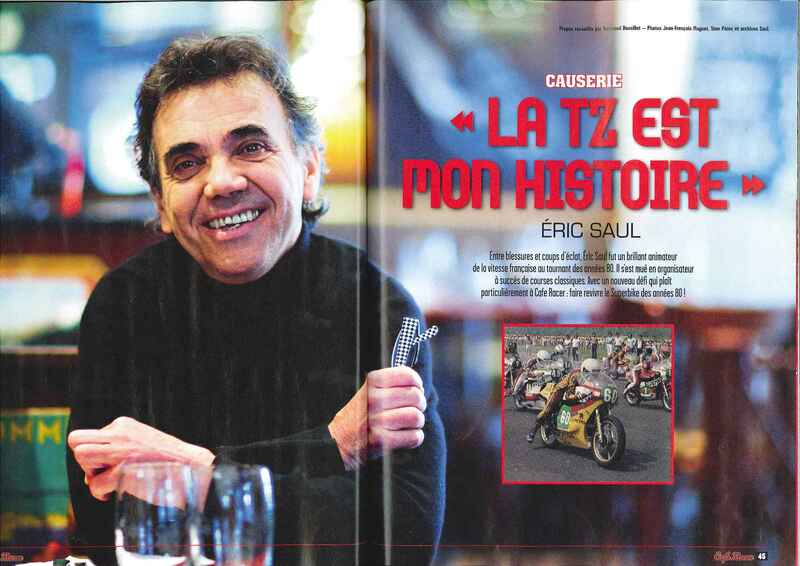 Eric Saul and ICSB in Café racer ! Eric saul learn more about himself and on ICSB Championship, unpublished pictures and his words of passion for organizing and racing ! The ICSB calendar is now ready and we are really happy to announce on top of the 3 races in France a race at Assen one week before the MotoGP. The race at Mettet in Belgium on the new track is under discussion and we will let you know when the organisers answer. For the licence a national licence with a start permission will be OK we will confirm within the next 2 weeks. ICSB registration form is here, please fill it and return to the mentionned address, you will be then added to the riders list and all details about races and so will be comunicated to you. les informations concernant les courses vous seront alors communiquées. ICGP riders benefit of free registration for the 1st year in ICSB. You will also receive a detail sheet to fill in for the website where you will be able to put a picture of your bike, sponsors details and others things. For more please Contact us ! 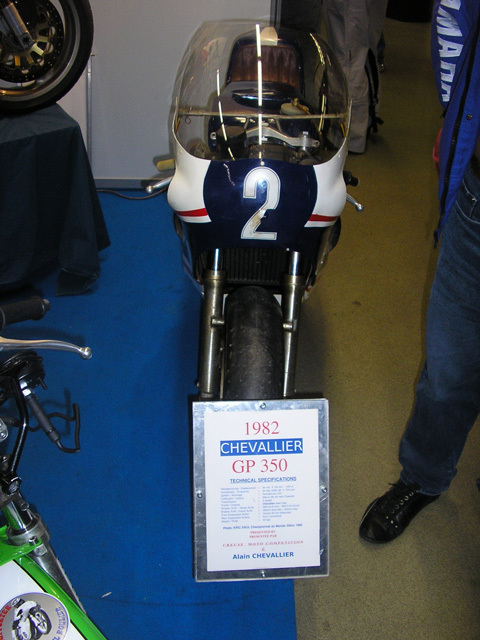 On the Creuse Motorcycle Competition stand in Vincennes on 20 to 22 November was unveiled a draft of a schedule. FFM is about to propose three races for this new 2010 Internationale Classic serie. 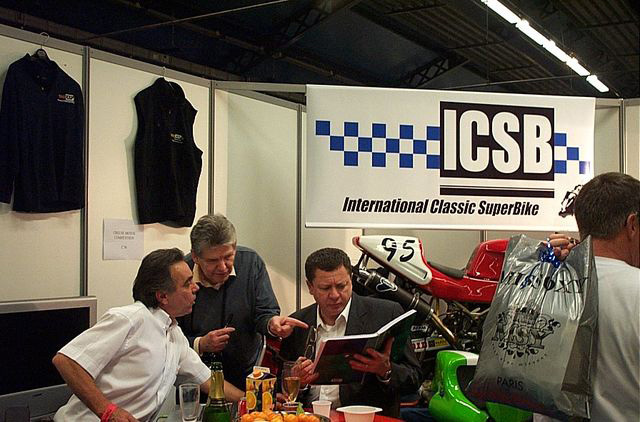 Jacques Bolles, the president of the FFM, was there to meet you and discussed the dates of what will become the ICSB, the official race schedule in 2010 is on track, there remain only some details ! In 2010, Jean Paul Boinet Will participate to ICSB championship. For this new Championship Jean Paul will drive a factory Ducati 888. 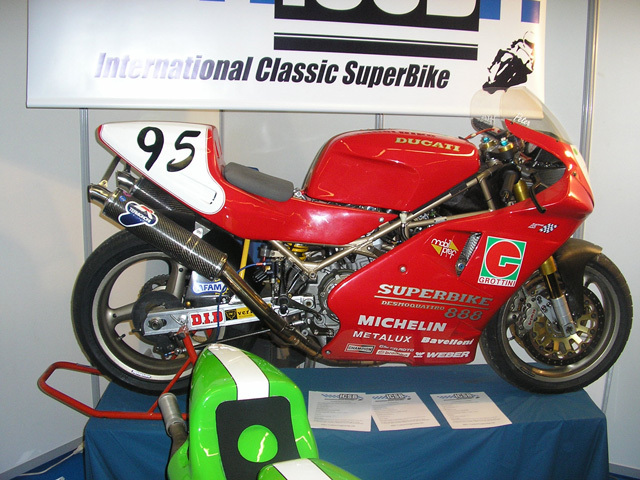 This bike driven by Mauro Lucchiari finished 10th in the World Superbike Championship 1993 and 3rd in European Championship. The bike will carry the colors of the famous team "JMB STRADALE" and Jean Paul will have Roland Simonetti as mecanicien, THE Ducati specialist, who was the Raymond Roche's eengineer when he won the World Superbike Championship. Another factory Ducati will be race the ICSB championship with Marco Luchinelli. On 20/09/2009 Eric Saul unveils the new category ICSB at Parc Floral de Vincennes. The "special envoys" from BIKE 70 were present. Gilbert Michel took photos of his pilots friends, about our favorite videographer, Jean Claude Jacq, he was on hand to make interviews of the greatest drivers interviewed by Jacques Bussillet. A big thank you to Jacques. do "menu" and "haute qualité"